The Macabre Observer: The Ghost of Stanley Street. The Ghost of Stanley Street. Strange goings on in Northampton. Do you believe in the supernatural? Would you believe it if I showed you a picture of a ghost? This is a true story and one that is difficult to write. Not only because I know those involved, but also I'm presenting myself to ridicule by those of my readers who utterly disbelieve in anything which could be seen as supernatural. Our story begins in 2014, but is embedded in the year 1906, I have changed the names of those involved in 2014 and purposely omitted the street number as others now live there. We begin with Emily. She rented the house in Stanley Street in 2014 aged just 21; her first foot hold in independence - new house, new life. She was soon joined by her friend Wendy and things looked great. She had a good job, was fending for herself and had the odd weekend on the town. Soon she noticed strange things happening in this house, doors banging (the wind? ), an oppressive atmosphere, a bit unusual but nothing that couldn't be explained. Now we must focus on the loft. Stanley Street is a Victorian terrace, they all look the same in and out with a front on the street and a small walled garden to the rear. When you enter the house by the front door you see a small passage with the stairs in front of you. Going up the stairs you reach a landing with a bathroom door straight ahead, and as you turn left there are two bedroom doors along another short passage. As we progress along the passage the last door is the main bedroom. Looking up to the ceiling we find the loft hatch, this is a small opening which can only be reached with a step ladder (which neither Emily or Wendy had - there wasn't one in the house). Please bear with me - this is important. The loft hatch is locked by a bolt that is pushed into a hole in the wood. It takes a person to climb up and throw the bolt to gain access. Noises were heard soon after the girls moved in, and the loft hatch was seen open on several occasions. However it took ten weeks for Emily and Wendy to investigate. On that fateful night Wendy climbed onto Emily's shoulders to take photographs by holding a phone camera at arms length and pressing the button. These photos were taken without a flash and looked just black! Not to be thwarted, Emily climbed onto Wendy's shoulders and after a struggle gained access to the loft. With the aid of a small torch Emily looked around. She saw a normal loft with a layer of insulation and the inside of a slate roof. She did notice some toys thrown into a corner, her memory is of some metal and fabric items and an "old style" toy pram. At this point her bravery failed and she climbed back down into the house. There was nothing else to be seen at all. After a while thoughts drifted back to the photographs of the loft, loading them up onto a PC gave the opportunity to lighten the black pictures. Most remained grainy and grey, but one photograph gave them a huge fright. 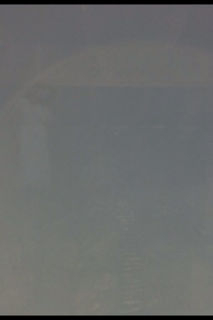 This photo was taken of the back of the loft and appears to show a grainy image of a woman with her head at a ghastly angle as if the neck was broken or throat severed. A grainy ghostly image emerged. This prompted Emily and Wendy to make a ouija board out of cardboard and enlist the help of two friends Bob and Jake. So, suitably fortified with wine they began. Soon a name was given, this was Hugh or Hughie. After several sessions on the ouija board spanning several weeks Hugh became a malignant presence, the atmosphere became oppressive. He would only make contact when Emily joined in (which really annoyed Wendy), ironically Emily was the most sceptical of the group and harboured thoughts they were just trying to scare her. Hugh said he was there to protect Emily, but his aura was pure evil. Before we turn to the events of 1906 one more event has to be mentioned. One Saturday night Emily and Wendy decided to "hit the town" and off they went to have fun. On returning to Stanley Street Emily went up stairs to her bed room. The loft hatch was open again, and a stuffed rabbit that had been among the toys in the loft was lying at her door. I must stress Emily was the only person with a key to the property at all times, Wendy was very much a guest and did not mind this set up. 1906, the tragedy of Annie Brown. The following is taken from the Derby Daily Telegraph Thursday 25th January 1906. "A single woman named Annie Brown (aged 30), lodging at Stanley Street, Northampton, was discovered sitting on a garden wall with her throat cut at three o'clock on Wednesday morning. 'I have the most extraordinary presentiment all through the night, which mother will tell you about, that I have to die tomorrow, and, if so, dearest, know that I die loving you, dearest, and reproach myself for all the unkind returns I have made for your kindness. I was only last night contemplating whether we could not be friends apart, and in the meantime I would retrieve all. My wickedness rises up and overpowers me, but God came to me in the night. I therefore know now that there is One, Frank. Do believe in Him and give up swearing. I know your good nature, but that will never take you to Heaven. Dearest, if we never meet on Earth again I pray we may meet in Heaven, With fondest love from your loving and affectionate Annie." Annie worked as a photographic canvasser, the inquest brought a verdict of "suicide whilst of unsound mind." It does make you wonder if "God" would want someone to commit suicide, perhaps it could have been this ominous "Hughie", we will never know, but the spirits of Stanley Street remain, Emily will never return to that blighted spot. The only modification has been a lighting of the original photo.